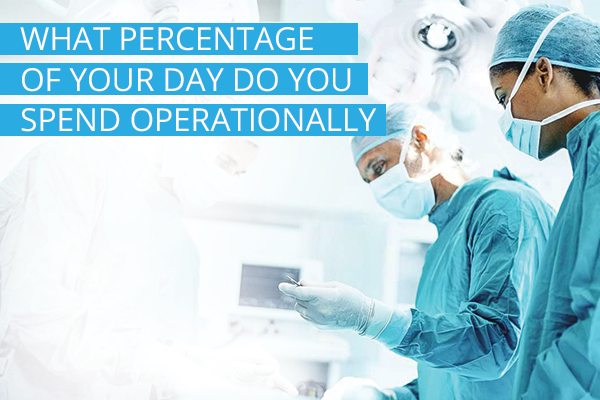 What percentage of your day do you spend operationally? And what percentage of your day do your spend strategically? What balance would take you to the next level? When giving my mentor an update on my business over breakfast one morning, I admitted that I didn’t have enough time in the day to work on strategy and had chosen to rather focus on the operational aspects of my business. “If you knew how busy I was, you would understand that decision,” I said. “Who do you look up to most in your industry?” my mentor asked me without any hesitation. I looked at him quizzically and then answered. “If that’s the person you look up to most, how many times bigger is his business relative to yours?” he asked. My business was relatively small at that stage so I would estimate that it was at least 100 times bigger. “If I had to ask him how much time he spent strategically and how much time operationally, do you think he would give me the same answer as you, about not having enough time to do both? Would his business be where it is today if he didn’t work on both daily?” Probably not. He stared at me, and then got up to make coffee. I knew at that point that I had to be more strategic than operational – no excuses. If you’re one of the many entrepreneurs who feel that they don’t have enough time to do everything, start by assessing how you spend your day and prioritise your time by cutting out the “rubbish” tasks where you aren’t being productive, for example, lying in front of the TV and watching soapies. Double dip and do two things at once, for example, make phone calls (on Bluetooth) while sitting in traffic, or jot down ideas in a notebook while walking on the treadmill or cycling on a stationary bike. Ask yourself what your business needs and find capacity within your team by making it more efficient and aligned. Identify the resources that you have at your disposal. Never abdicate sales. Entrepreneurs, more often than not, will choose to give sales to someone else without giving this task a second thought. Abdication is not the same as delegation because, when you abdicate a task, you simply refuse to take responsibility for it. 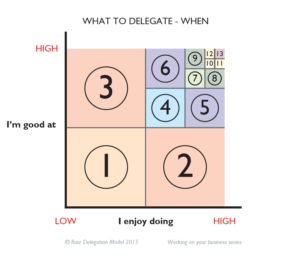 Once you’ve looked through the three lenses, take a look at the Delegation Model below and figure out what quadrant you fall into per task. If you need financial management, but don’t enjoy that task and are not very good at it, you fall into the first quadrant. Delegate that task to someone else if you have the resources to do so; and if you don’t, this will inform the first resource that you will have to find. Repeat this process above for every task that you do. Many entrepreneurs struggle to just let go and delegate tasks to new employees, and the reality is that you as a business owner can’t do everything on your own if you expect your business to grow. Find great people who are great at what they do (which is not always easy, but is possible) to work with you and they will compliment your weaknesses. Be cautious when delegating, and always take your business’s needs into consideration first. In doing so, you will free up the time you need to be more strategic in your business. Stop saying you don’t have enough time in your day, because the person you aspire to be and look up to has found the time to do everything you aren’t able to and be a success.